Sometimes when I am up in the middle of the night feeding Ronin I browse around on some of my favorite Instagram hastags, such as #Paleo, #lowcarb, #eatclean #cleaneating etc. I love looking there for yummy and healthy meal ideas for my family. The other night I spotted something that I was so interested in making. Zucchini pasta. The user who uploaded her picture did not have a blog or a recipe so I did a little researching and used this recipe as a guideline as far as how to prepare the noodles. For those of you who are reading and looking at this thinking "gross," this is far from gross. I PROMISE you will never think of zucchini the same and I mean that in the best way possible. Cut the ends off of the zucchini and peel off the skin. Use a vegetable peeler to make thin "pasta like" strips. Stop when you get to the seeds. 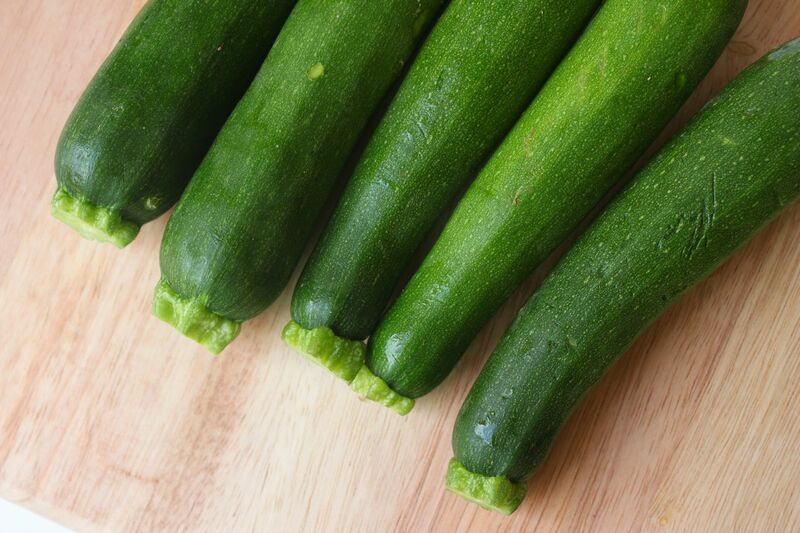 Place the zuchinni strips into a colander and toss with a little bit of salt. Let the zucchini drain in the sink for about 35 minutes. (The zucchini is not cooked for this recipe). 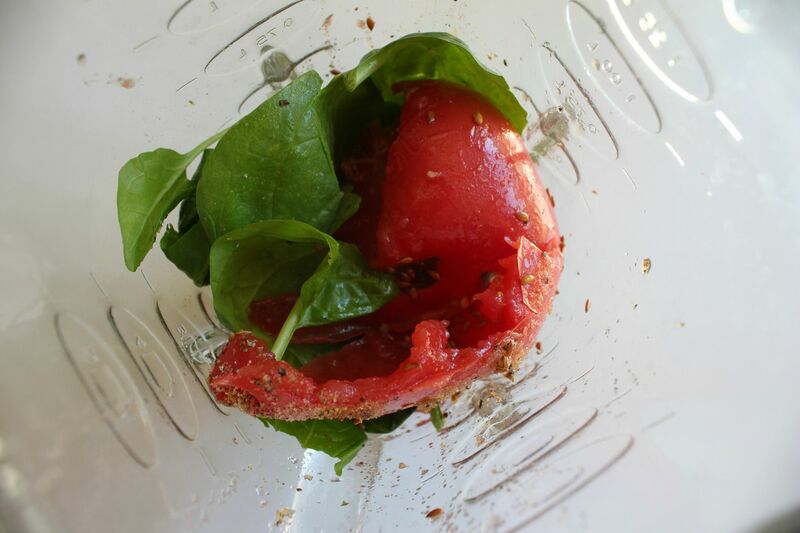 Combine the tomatoes, olive oil, chopped garlic, spinach, flax seeds and salt and pepper into a blender and puree until smooth. Divide up the noodles and place desired amount of sauce on top. Top with fresh tomatoes and flax seeds. Okay so zucchini is not the most photogenic food but you will not believe how good this tastes. I wanted to eat bowls and bowls of it. Next time I am going to make a turkey, basil and meat marina sauce...so many possibilities! I might even like this better than skinny spaghetti. i love this. have made it a few times, always delicious!! So you don't cook the zucchini at all? How interesting! I need to try this. I do miss my homemade meat sauce big time trying to be all Paleo over here. Spaghetti squash is good, but this may do the trick too! PS. I just added you to my blogroll, you're becoming a daily must read! Jessica- No, you don't cook the zucchini...I know sounds so strange but it is SOO good. 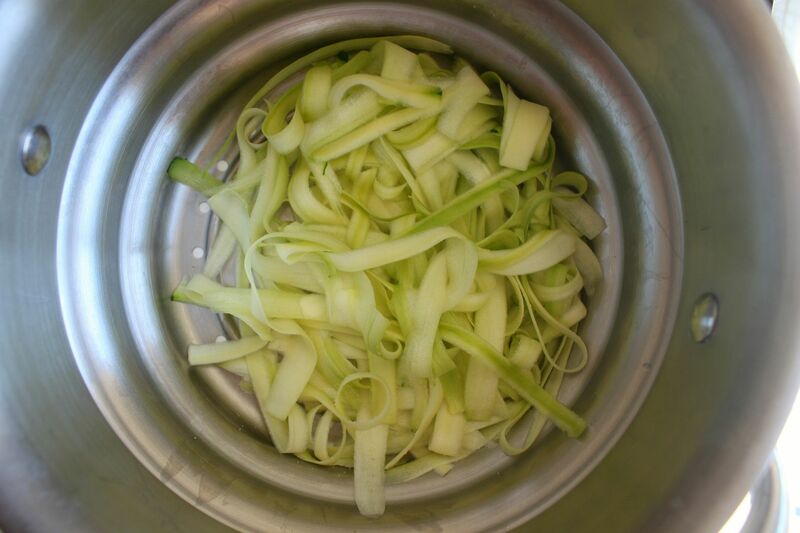 I've made zucchini pasta before, and for whatever reason never thought to try it raw. I usually cook it in a skillet with a little bit of coconut oil. I'll have to try it this way later this week. Thanks for all your delicious recipes! I do this all the time! SO yummy! Have you tried using a julienne peeler? That's what I use (we eat the peel that way, too!) - we also have used some yellow squash mixed in, and that works as well. Oh, and if you want to use the seedy part in something, I put it in the sauce when I puree it! Oh, and my new go-to marinara is a roasted tomato marinara (you don't have to blanch and peel the tomatoes!) based on this recipe I pinned here: http://pinterest.com/pin/112660428149251589/ (this takes you to my pin on pinterest, where I pinned it and remarked on what changes I made to the original recipe). SO YUM! This looks awesome! When we get home from vacation.... and finished with 'vacation eating'... I will totally make this! YUM!!! This looks soooo good!!! YUM! We have so many zucchini right now. I LOVE IT! I'm going to have to try that! I've used sliced zucchini instead of lasagna noodles, and that turned out fantastic, so I bet this will be just as good. Mmm... This sounds delicious and we also have lots of zucchini these days!! :) Yum, yum! WOW what a great blog cant believe this is my first time here I am VERY excited to be your newest followe I can learn lots from you. This dish looks right up my alley it will go on my MUST MAKE list! Come and check out my blog and give me some tips and maybe even follow back if you get a chance. I would deeply appreciate it :). Have a wonderful day and keep up the awesome posts. YOU GO GIRL! This sounds so good! I love trying different zucchini recipes but I had not heard of zucchini pasta! You are the best at finding new and inventive recipes, and then sharing them with us :) I still need to make those paleo chocolate chip cookies. ummm, yum!! I think the picture makes this dish look amazing!! this is definitely intriguing. although i have to get a vegetable peeler to try it. Perfecto! We have some zucchini from the garden left over so now I have some inspiration instead of the boring old just grilling it with some olive oil! Thanks for sharing. i linked you from my blog with your recipe, and my version that i made. I want to eat this every night!! My momma always used to do that! Try adding carrot too, stripped like you did with the zucchini. It's awesome! Sounds delicious! I already love zucchini so I want to try this! I made this the other night and was SO surprised to how much this tastes, looks and feels like pasta. The slight bite is the perfect al dente bite pasta has. I tossed mine in a saute pan to heat up a bit with my home made marinara sauce. The one thing I've been missing while going Paleo is my mom's Sunday pasta dinners. The cheating has caused stomach aches, so this is a nice alternative! We just made Pelo spaghetti last night with spaghetti sqaush and that was pretty yum. glad to ave an alternative! I love zucchini pasta! I eat it all the time and it works so well with everything! 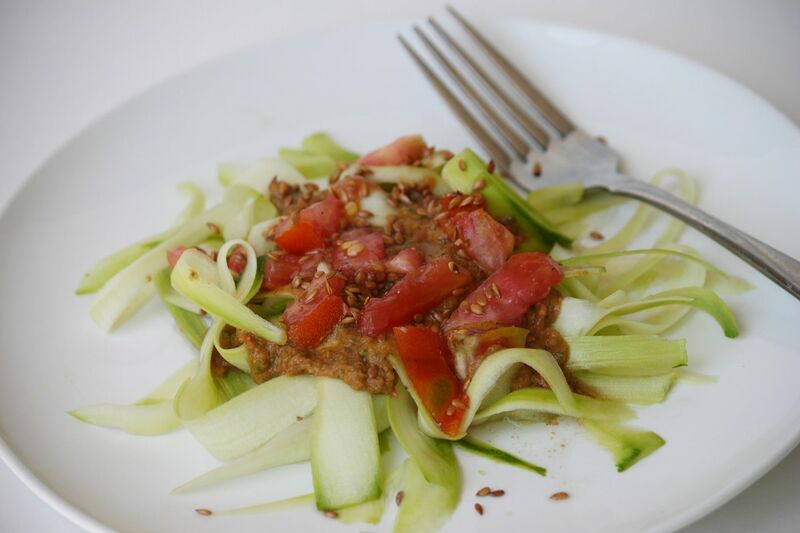 Paleo can be so much fun in the kitchen! So yum! Thanks for sharing! I just blogged about this here!